The Assistant ASM 2.1L is a compact module which can be equipped with up to three device modules. The assistent combines valves, pumps, degassers and a UV detector. Depending on the integrated modules the assistant fulfills many different tasks like eluent delivery, detection, sample and eluent selection, sample injection, column switching or fraction collection. 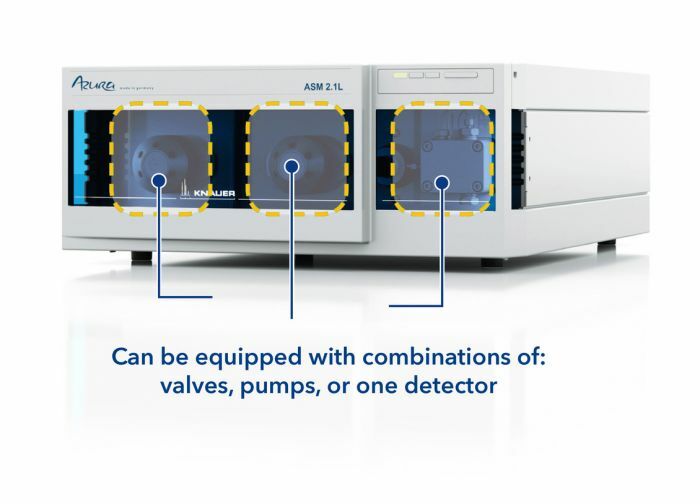 An assistant including a pump, valve, and detector features a compact chromatographic system. As a part of a larger system, the ASM 2.1L is extremely versatile in analytical, preparative and continuous liquid chromatography. A leak sensor and the capillary guidance, as well as the optional display software Mobile Control, facilitate a safe and user-friendly operation. The concept of the flexible combination of device modules combines the highest functionality with minimal space requirements. Choose from more than 4000 different combinations.